Today, on our Come Together community segments, Jenn Hebert from Roca Kidz Club joined Lori to discuss the Practical Outreach they do. They started off talking about Roca’s eight year anniversary coming up in June, and how they started the mission to Manchester after seeing how The Buffalo Dream Center in New York did their outreach. Jenn told us how they “See a need, and meet a need”, and encouraged us that we don’t need to ask for approval. 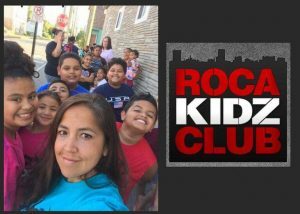 Next, Jenn highlighted other organizations that support Roca’s vision of loving kids, and she told us how grateful she is for the volunteers who commit to the mission every week. Jenn also told us they plan to start a Friday night outreach for teens who need alternatives. Finally, Jenn told us she was a Tour Representative for Billy Graham who will be coming to our city in May. Finally, she encouraged us to get involved in volunteer training for this big event. Listen in and here more about it!